Chionodoxa Luciliae – Little Blue Stars Blooming in Spring! Chionodoxa Luciliae is a striking little spring flower. The light blue flowers look little stars. Glory of the Snow has its origins in Turkey. This flower is a bulbous perennial and belongs to the Hycinthaceae family. It is a harbinger of spring just like other early spring blooming flowers: the snowdrop flower, the winter aconite, the primrose flower, the daffodil flower, crocus flowers, pansy flowers, tulip flowers and scilla siberica. Glory of the snow flowers are often confused with Scilla Siberica, the Siberian Squill. Yet, there are simple ways to tell them apart: Chionodoxa flowers face upward, the blue colour of the flower is paler and have a white centre. Also, the stamens are narrowly clustered together. Scilla flowers face downward, have a bright blue colour and the stamens are not clustered together. Glory of the Snow is easy to grow and makes a pretty garden plant. They naturalize very well and the carpet of this little blue flowers will grow every year. Sometimes it is even a good idea to take out excessive bulbs to avoid overpopulation. First, choose a sunny or a partially shady location. In autumn, place the bulbs about eight centimetres deep in the earth (the tip of the bulbs must look upwards) and a couple of centimetres apart. The soil should be fertile and have a good drainage. 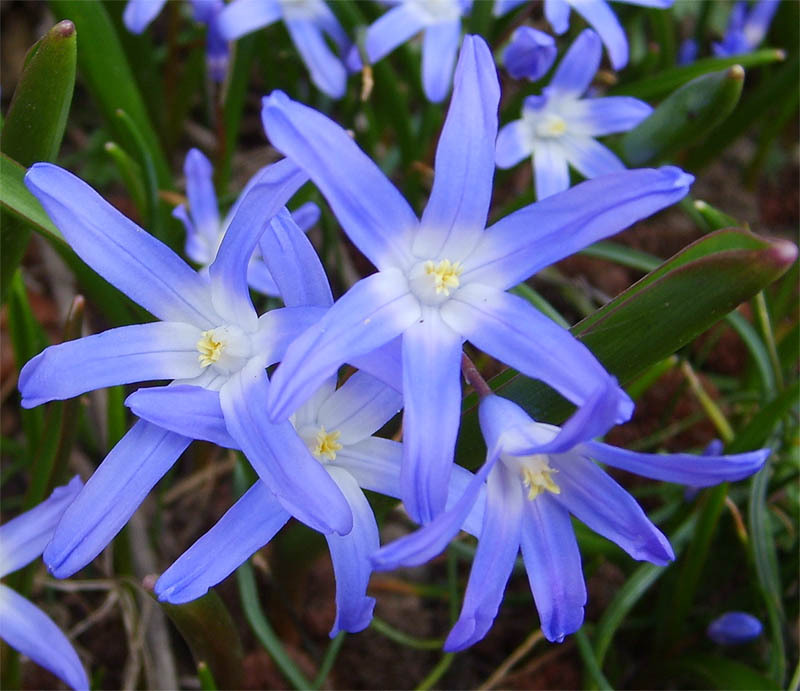 Watch the Chionodoxa flowers thrive in early spring and enjoy!